“It got very nasty very quickly, and we became separated into three groups. Their hands became so cold that it became too difficult to open their packs to find food. It was not until a woman collapsed with hypothermia that they decided to head back, he said. Two Auckland trampers, Ghaz Jabur and Graham Plows, found the confused and hysterical group late in the morning and helped them off the mountain. They also contacted police by cellphone. The men gave spare clothes they had in their packs to the worst-affected and tried to get them out of the wind. “All we could do was grab them and pull them down the slope. We did this for about 10 to 20 minutes, it was totally exhausting. “Two guys and two of the girls were in a really bad way. They were shaking involuntarily, they had hypothermia and their eyes were rolling. They couldn’t put food in their mouths; they would have died for sure. For me, it’s a reminder that the Tongariro Crossing is one of the wackiest places I’ve been in New Zealand in terms of seeing unprepared people in a wild, potentially very isolated, changeable and dangerous environment. I wrote about this problem of inexperience combined with popularity at the Tongariro Crossing a couple of years ago, and this TVNZ Close Up story from a few months before impresses the extent of the problem. It’d be premature to try to comment on specifics of exactly what happened with regard to advice given, but I’m not entirely sure it’s relevant. While it’s good to have responsible people on the edges, assigning blame to operators for dropping off and collecting people who aren’t prepared also ignores the bulk of the problem. That said, it also feels simplistic to just assign blame to people themselves and go no further—there are bigger things happening. Even if 16 people found themselves in trouble and had inadequate clothing and weren’t properly aware of the forecast and nearly died, and even if it is their own fault, they still weren’t doing anything especially different from what a substantial proportion of people have been doing before them and will likely continue to do in the future. In that respect, these people just happened to be the unlucky ones out of the crowd. For me, that is a much bigger problem, and this incident is merely symptomatic. I’ll consider the shuttle operator’s responsibility before going further. Only you, or someone with you and in control of decisions, can possibly be responsible for your safety in an outdoor situation. Furthermore, everyone’s different with different needs and intents. Someone who drives a shuttle can’t possibly be expected to reliably gauge what’s right for every person they meet. They can’t always perfectly judge who they’re transporting, and they can have off days like everyone else. The fact that other people were on Tongariro that day (ie. those who discovered and rescued the group) without issues suggests that a properly equipped and experienced person would have been fine. It may be that advice from a driver was badly formed or worded, or incorrectly interpreted, or perhaps they just made a mistake. Maybe it was completely irresponsible. I’m not certain we’re necessarily hearing the full story, but I also don’t think it should be a critical consideration. Hanging the safety of anyone on the thin strand of an individual operator’s ability to never make a mistake about a future they have no control over before they wave goodbye at the end of a road is asking for trouble. Those in a group need to be aware of that limitation, and if they aren’t then it’s something that needs fixing. In my opinion it’s never a good excuse to say you nearly died because of bad advice from another person who isn’t there. Once you enter the back-country, you really are on your own and must be prepared to deal with unexpected problems without assistance, at the very least for a reasonable amount of time to allow help to arrive, which could potentially be days away in atrocious conditions. Should the group have been responsible for themselves and prepared better? Of course, and it sounds as if the people of this group made some extremely bad decisions and nearly paid a very serious price for it, but it’s also not as simple as that. When so many people consistently do something so potentially risky without appreciating or realising what they’re doing, there’s something else happening. In this case I think there’s something uncomfortably wrong with the New Zealand tourism juggernaut when it comes to the Tongariro Crossing. A heuristic is a rule of thumb that can be used to simplify a decision and measure the differences between situations according to pre-determined rules that are easy to assess. For instance, a road authority might decide which roads to improve by considering the number of reported accidents per kilometre, without necessarily examining the roads directly. “Number of reported accidents per kilometre” is a heuristic that’s easy and inexpensive to measure, and which can allow existing roads to be compared in a vaguely objective way. In outdoor situations, a very common heuristic application is to estimate how long it’ll take to climb a hill based on contour lines from a map. In the groups I’ve been in, we’ll often look at a map and presume we’ll climb roughly 300 vertical metres an hour as a general rule, and for us it usually works, so it’s very useful. A heuristic trap is an occasion in which an incorrect rule of thumb is applied to assess a situation. The “300 vertical metres per hour” heuristic could become a trap if it’s applied when a group has a very exhausted member, or if the route turns out to be very overgrown and slower than expected. For such cases, it’s advisable to be prepared, such as by always carrying adequate portable shelter. Sometimes heuristics have little resemblance to the situation in which they’re being applied, and this is also very risky. For example, guessing how long it’d take to reach the top of a steep hill by measuring the horizontal distance from bottom to top would be unlikely to produce consistently accurate results, and a party might fail to reach an intended destination by an expected time, but people sometimes do this. “The river looks a high but there’s warm, dry shelter on the other side that I’d rather have than camping out, so I’ll cross.” The safety of the river is unaffected by what’s on the other side. ”Everyone else is doing it so it must be safe.” This makes no consideration of the actual danger so much as watching what other people are doing and presuming they know what they’re doing and that you can do it too. ”Something moved and I know there are deer out there, so I’ll shoot.” This is a classic way that hunters shoot their mates, and it’s a clear heuristic trap. Heuristic traps, where people apply irrational reasoning, are recognised in many back-country accidents, which is why there’s so much ongoing emphasis in the wider community for people to become familiar with the common ones. First-hand experience is one of the best ways to better understand and cope with heuristic traps, so as to become more familiar with the risks. For instance, a good river safety course will provide good first-hand and direct experience of how dangerous rivers can be, perhaps by letting people experiment and be swept away in a controlled environment. It will give people a more complete picture for when they’re making their assessments for real, and falling into the heuristic trap becomes less likely (though still possible). On the opposite side of the equation to understanding risk, it’s also possible to reduce the incentives for rationalising unnecessary risks away. For instance, a common incentive and rationale for taking risks is to prevent friends and family from worrying, so carrying a Mountain Radio, SPOT Beacon or Satphone to retain a link to those at home in case of delays can help avert this incentive. Mentally preparing and equipping one-self to potentially take longer than expected might also help, even if returning late was never the initial intent. Despite so much emphasis, some people still get themselves into trouble having fallen into heuristic traps, even in full knowledge of them. As I stated earlier I believe personal responsibility is paramount and there’s no valid excuse for not accepting it, but the Tongariro Crossing is a weird case because it’s such a massive outlier in terms of the number of people it reaches, many of whom have never touched the New Zealand back-country before and many of whom will never do so again. The tourism industry, officially and unofficially, routinely spreads promotion of the Tongariro Crossing as one of the best daywalks in the world. You’ll find that claim in popular international guides like Lonely Planet, you’ll find it promoted by a variety of tourism operators, you’ll find people chattering and recommending things informally on travel website forums and (once people arrive and start travelling) in the back rooms of backpackers throughout the country. It’s a major reason for some people to come and visit. For anyone who can only afford or be bothered with a single outdoor New Zealand experience in the North Island without the complications of overnight tramping, it’s one of the most accessible top places on the list. Huge numbers of people walk it, sometimes up to 1,000 people on a popular day. Nearly 80% of those who walk the Tongariro Crossing are overseas visitors who come to New Zealand as part of a wider world trip, or having been to other parts of the world. Visit a variety of comparable attractions on the popular tourist trails overseas, and you’ll often find highly controlled experiences. You’ll find backpacker tourists being shepherded through hiking experiences with guides, or without guides but still never too far from danger and reliable shelter or help. You’ll find good steps and handrails and reliable cellphone reception in many of the potentially dangerous places. Gates will often be closed to lock everyone out at times when a government or exclusive operator believes there’s too much risk for tourists, and you’ll often find relatively stable climates with dangerous weather reliably predictable well in advance. Even across the ditch in some parts of Australia, it’s common for park authorities to close access or strictly control entry to some parks on safety grounds. Such things are not the Tongariro Crossing, or nearly any part of New Zealand’s wilderness. Despite having largely open access to the public, it’s a wild environment that’s quite risky on its day for reasons that won’t always be present in people’s experience to date, and it needs to be treated as such. I’m insanely happy that the Tongariro Crossing is not a highly controlled experience as exists in some other places and I sincerely hope it never becomes one, yet the major tourist trail aspect of the Crossing means its perception could be completely disconnected from what it actually is in the eyes of many visitors. People often have strange ways of weighing risks against benefits which don’t always consider full implications, and there’s a lot of research in this. In this case it’s frequently, but not exclusively, young and inexperienced people who will happily reinforce their decisions by telling each other that things are fine. It shouldn’t be a surprise that people so often read about the risks, consider them in a fallacious mental equation of human nature, and convince themselves that it’s really not so bad to attempt the Tongariro Crossing after all. The tourism marketing machine, officially and unofficially, ensures that people really really want the benefits. The risks, meanwhile, remain exactly the same, not affected in the slightest by hype in the opposing direction, and they’re often not fully understood besides. Rationality goes out the window, and unhelpfully “most” people do get through the Tongariro Crossing without a hitch… until something like Saturday’s event occurs. I don’t have clear answers of how to fix this, aside for knowing of several things I definitely don’t want to happen, but I do think there needs to be a serious discussion. It needs to involve proper research about where people get their information and how they perceive and weigh the risks with the benefits. Then it needs to be acted on to ensure that when people decide they want to walk the Tongariro Crossing, they’re less likely to convince themselves to take stupid chances with or without realising it. The Department of Conservation has already attempted to change how people perceive the walk. For instance, several years ago it pushed for operators to begin referring to the walk as the “Tongariro Alpine Crossing”. I’m not convinced it’s working, though. As I indicated in my post a couple of years back, I don’t think much will change around the Tongariro Crossing until an unexpected storm comes along and wipes 50 unprepared tourists off the mountain. I sincerely hope this doesn’t occur, in part for the obvious devastation it’d cause for those involved and also for the knee-jerk responses I think it might provoke. That said, it might be that but for a few fortunate coincidences, the situation on Saturday came close to something comparable happening. This entry was posted in article and tagged article, department of conservation, media, search and rescue, tongariro, tongariro national park. Bookmark the permalink. We were on Taranaki last weekend and exactly the same thing is starting to happen there. I was suprised about how many foreign day summitters there were on the mountain that day late in April, dressed almost uniformly in jeans and sweatshirt. I guess the best you can do is provide a large checklist style sign at the start of the track. STOP. If you dont have these items TURN AROUND. The rest as they say is the fate of the individuals concerned. Hi Peter. Yeah, I remember Taranaki. 🙂 I think part of the problem is that by the time people arrive at the doorstep, it’s too late to tell them they need this and that and this, which by the way is not available right here and now, and will cost a lot or otherwise inconvenience you unless you know someone. They’ve already made up their minds to do it based on loose information, they can see lots of other people doing it, and suddenly there’s an incentive to rationalise the risks away using all sorts of dodgy reasoning. As I said I don’t really know how to fix this, but I’m not sure simply putting up signs is enough to change much. It’s true that many of this kind of visitor are from foreign lands and not residents, but I should also note (if I wasn’t clear earlier) that I don’t think that’s terribly relevant. Kiwis can be just as guilty (just as visitors from overseas can be perfectly adequately prepared and know exactly what they’re doing), and my possibly incorrect understanding is that this group of 16 was made of people living in Auckland. Unfortunately, I don’t think there is any real way to fix this except by stopping the marketing machine – which of course will never happen, as the Crossing generates far too much profit. As an overseas visitor myself, I meet and talk with a fair few backpackers. I don’t think I’ve ever met one yet that refered to this walk as the Alpine Crossing. The precious few who know of that added adjective sometimes think it’s actually a different walk from “just the Crossing”. As such, I don’t believe the change of name does anything to raise awareness and improve safety. It could even do the reverse – Alpine sounds quite grand and exciting, all the more reason to be dead set on doing the walk, no matter how little equipment you’ve got or how bad the conditions may get on the day (by the way, you did a great job with that bullet-point list of justifications – god knows I’ve been guilty of some of them myself in the past). I strongly believe that usually, only trampers and nature lovers go out hiking into the bush all day. They tend to be smart and well-prepared even if they’re not necessarily extremely experienced – not always perfect, perhaps, but not too bad overall. However, with a walk such as the Crossing that is so heavily marketed, people who have never ever hiked in their life, may never ever hike again, and might not even have one ounce of interest in hiking/nature usually, suddenly feel obligated to go. It’s a must do, and so it must be done. There is not much more to it, really. Although these people do not have a clue and do not belong out there, as long as they are told to go by the gods of marketing, they will keep going. The rest does not matter. No warning sign or message will ever be strong enough to compete with the lure of advertisement and the promise of a trip highlight. This might be especially true in our modern society, where we are becoming more and more saturated with all manners of warnings telling us about the dangers (real or imagined) of everything and anything – we just grow complacent, because we are so used to ignoring them. Except out in the bush, they tend to be true. Hi Toothbrush, thanks for the insight and it’s good to know I might be on the right track. I’m a kiwi of course, but I’ve spent the odd night in backpacker accommodation (in NZ and overseas) and spoken to people from time to time, and I guess that’s where I’ve had the impression from. I don’t know what to do about the marketing machine. It’s taken on a life of its own in a sense. I don’t consider locking people out to be an option for a variety of reasons aside from it being generally illegal, but the only likely alternatives that come to mind at first would be to augment the area to try and make it less risky for people. eg. Creating regular communication points and emergency shelters, cheap (possibly subsidised) safety equipment that’s easily accessible at either end of the track, and so on. The problem with this sort of stuff is that it could be as likely to increase the risk by encouraging people to be lazy and slack as it might be to reduce the risks. I do think your suggestions would make the track safer. But I also have a problem with them – they may alleviate symptoms, but they are not a cure to the disease. Personally, I would hate to see new infrastructure pop up everywhere (be in on the Crossing or other tracks) just because people cannot be made to be responsible for themselves. New Zealanders are already lucky enough to have an amazing network of backcountry huts to shelter them from the elements when needed. You don’t really need more. When I go bush, I want to be in the wilderness – to see and experience wild spaces, to feel the quiet and listen to the wind. Seeing brand new shelters and communication devices erected every few k’s would definitely detract from that. A lot. It is not and should not be what going tramping is about. Locking people out seems unthinkable – it’s an affront to personal freedom. Also, experienced trampers should not be hampered because of unprepared tourists. You can’t put everyone in the same basket. Safety equipment at the trailheads is a good idea that does not interfere with the experience, but of course one would have to wonder how long until it gets stolen or vandalised? Mangatepopo Car Park has a bit of a reputation, and it’s not a nice one. Hi @Toothbrush. I agree and I’m really not in favour of what I proposed above, certainly not the ideas that would involve removing the wilderness factor, or what remains of it when you’re potentially surrounded by hundreds of other people. I’d find a lock-out alternative quite offensive, but if there’s a way to actually implement it (tough in itself given how many access points there are for the park), I wouldn’t put it past someone to actually try it down the line—that sort of solution is acceptable in some places, but I like taking my free and open access to public land for granted, thank you very much. I think it’s really necessary to focus on conditioning people to be better prepared (mentally and physically) for what they’re actually wanting to do, and at least make it easy for them to do it right — even in situations where plans have been made on short notice. Not necessarily easy. Great write up, agree with you! Thanks! I agree with your agreement with me. Something you pointed out in your facebook post (which I saw), which I didn’t think to mention here but deserves a mention, is that the protocol of all the other shuttle companies to refuse to deliver people to the crossing is one that … although maybe prudent under the circumstances … can also potentially create a new annoyance or risk in itself, given that it’s still arguably safe for properly prepared and aware people to visit. And true (from what you said), if the two people who rescued this group had been booked on one of these shuttles but refused a drop-off due to the weather, there’s a reasonable chance that four or five or more corpses would be been flown off the mountain. 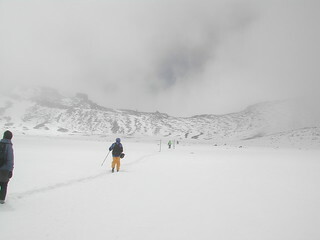 My two times doing the Tongariro Crossing were in summer so heatstroke was more of a risk than hypothermia. Agree about the lack of appropriate gear or clothing for many of the people on the route – and most of them get away with it, so as you say, the risk taking continues. It’s not a problem limited to the Tongariro. The day trippers on the south rim of the Grand Canyon in the US are incredible to behold. (High heels, flip flops). Luckily most of them only go as far as the first water station (or less) but the rangers do rescue a large number of people and there are frequent fatalities. So marketing of “the great outdoors” is a world wide problem. Hi Thea. Yeah, I bet it is. 🙁 Do you know of any useful steps that have been taken there to dissuade people from taking risks? I would ask whether they perhaps didn’t realise they would be out in that for many hours, but then I had someone want to come on my round the mountain last year who did not realise that a light windbreaker would NOT be sufficient if we hit bad weather, that she would be soaked through quickly. Even when I told her, she said she would just add another light-weight rain layer. However, she was a visiting traveller, only in the country for a few months. And I do know some people who think their down jackets and fleece are waterPROOF, when they are really only water repellant, and then only when they are new. Hi Amelia. Yes, I think I also read about the rain during the drop-off. It might be the driver made a stupid mistake to let them go and there may be room for improvement, but if drivers have to try and judge everyone single person and group they deliver whilst having no control over what those people will actually do, it can’t be expected that they’ll get it right every single time unless they become absurdly conservative in their judgement. Without lots of effort that goes beyond the service they offer, how can a driver know someone has no appropriate raincoat? How can the driver know that jeans in the bus won’t be replaced with something more appropriate as soon as the walk starts? Especially when people are meant to be researching this sort of thing and preparing themselves before they leave. At some point the responsibility really has to be pushed onto those who put themselves at risk. And yeah, people have flawed mental models of what they’re walking into based on past experiences. No wonder they’re so open to applying inappropriate rules of thumb. Tourists wouldn’t hear of the accidents or incidents unless they have been in NZ and reading local news. Yep, true. Within DoC it seems to be different depending on the conservancy and who’s running things. You must have seen the signs near Field Hut and possibly Penn Creek Hut that verbosely inform people that people are often rescued on the Penn Creek Track. Cheers. As a follow-up, the Dominion Post published an editorial this morning which is highly critical of the operator, but which I also think looks through a large part of the problem. Interesting stuff. I remember talking with a DOC employee 15 years ago, who said that sooner or later they’d need a helicopter to ferry the bodies off Tongariro. I think that there are a couple of points still to be made, however. I agree with Mike (well, how convenient 🙂 ) that relying on the driver to make your safety decisions is a bad practice. It’s a bit like blaming a taxi driver for taking you to the pub…surely his real responsibility ends at the door of the vehicle, his commentary is only advice. However, I do wonder whether a kind of group mentality isn’t part of the problem. I do all my tramping alone, and I’m almost neurotically cautious…I always carry shelter, extra food, a PLB…yadda yadda…because I know that ‘alone’ can become very real in the outdoors. But no-one is ever alone on the Tongariro crossing, and I think the false security of group behaviour is impossible to control; it’s part of us. I walked around Ruapehu a couple of weeks before the incident being discussed, I camped out in the Rangipo the first night, but spent the second in a hut where I met a group of young people on some kind of outdoor skills/leadership course. They talked of all the tracks they’d done and similar things; they were a great bunch. However, as they were writing up their trip reports, under supervision, it transpired that none of them had a watch. Clearly, not one of them had any idea of how long they had walked or what speed ‘over the map’ they were making. Being in a group seemed to have absolved any individual from the responsibility of decision making. I think that is the biggest problem with the Tongariro Crossing…few people actually make a decision to do much except to ‘go along’. I’d also like to lend my support to your comment about the comparison with overseas conditions. In slightly different circumstances I needed to explain to a group of Korean visitors that access to an area was not the same as access to a theme park, and that this was not a controlled experience. I think that was also apparent in the Close Up video, it seemed that the issue of risk vs danger was totally uncomprehended. It’s not a dangerous place; I’ve been across in winter and had a great day. However, it is a risky place…I’ve been there and watched the weather closing and felt my sandwich catch in my throat and suddenly had a strong desire to be lower down the mountain. I have no idea how you teach this to people though. I am sure that I’d rather have anything other than restricted access. It IS a mountain, it IS a risk taking venture, itIS really really outdoors; if people don’t want to understand that, it’s like those hardy few who get out of the car in a lion safari park. I have sympathy, but I still wonder what they were thinking, or if. The outdoors is not a vicarious thrill, and I think we may have got used to the roller coaster form of excitement and we no longer realise that we only control a small part of the planet. Hi Scott. Thanks for the thoughts which I tend to agree with strongly. Purely in the frame of this post I think I’d consider it another heuristic trap to be saying something like “it’s safe because there are always so many people around and they can help if we get in trouble”. People travel more safely in groups and always have done. weighing up choices with other people invariably leads to safer decisions, even though the party may be less experienced. There are clear objective dangers in tramping on your own, river crossing being the obvious example, but there are also more subtle dangers that can cause solo trampers to occasionally disappear off the map. When tramping on your own your assessment of risk is impaired—you have to make every route decision and every choice. Because you are more vulnerable in the mountains it might be expected that you would make conservative, safe decisions, but in my experience that isn’t necessarily the case. Your motivation is higher and that seems to put stress on your decision making. You have set a goal and are more determined to make it to the top or get to the other side. In a mutual decision, a group of trampers might decide not to risk a river crossing, and because the decision is shared the sense of failure is lessened. Solo trampers are perhaps more impelled to take a chance because the sense of failure is not shared—it’s theirs alone. “For me, it’s a reminder that the Tongariro Crossing is one of the wackiest places I’ve been in New Zealand in terms of seeing unprepared people in a wild, potentially very isolated, changeable and dangerous environment.” Maybe it really is as simple as that: DOC efforts to promote it as a great walk have simply made it very easy for people to get into a place where they wouldn’t otherwise be. The shuttles and staircases mean that it is approachable by people who would never otherwise have been there at all. Perhaps there is no heuristic problem, simply an ignoring of reality in pursuit of money. Could be. That thought’s crossed my mind. Also note that it’s not just DoC that promotes it. DoC helps and perhaps isn’t fazed by the promotion given its mandate to foster recreation, but the entire tourist industry promotes it too. In part DoC responds to manage the in-flux of visitors and try and lessen the impact. The mandate says nothing about targeting recreation for people who actually live in New Zealand. If DoC flew people into the country and told them to go for a walk, it’d be fulfulling its mandate, albeit somewhat stupidly, but sometimes I wonder if that’s almost what’s going on in some areas. In related news, another five people rescued. Small follow-up via a press release from the Tourism Industry Association (republished on Voxy if the other link goes stale): DoC is changing its requirements for concession holders so that all transport operators will be required to hold membership of TACTAG, which is the group of transport operators that sets minimum gear and weather forecast requirements and requires members to abide by its protocols. I’m not sure if it was directly reported anywhere, but according to this morning’s Herald, another ten people were recently rescued from the Tongariro Crossing. Just did Tongariro Crossing.Crocs,jeans,t shirts are common attire.Yes people should be warned about the realities of weather changes.I do not believe shuttle operators should be responsible for peoples own poor choices and ignorance.Information about what you should take in case of adverse weather I’d available online.Also if you need to be rescued because you had inadequate clothing you should pay for full cost of rescue.This might may some people act responsibly and wise up.